﻿Since I eat out quite often I thought I'd start to post about some of the places I frequent. 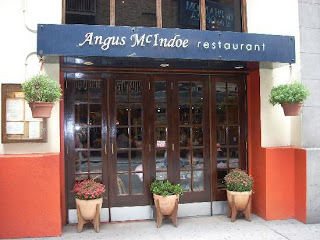 Angus McIndoe is located in the heart of the theater district. It's on West 44th Street between Broadway and 8th Avenue - in my opinion, the gold coast of Broadway - across the street from the Majestic Theater, the Broadhurst and the crown jewel, the Shubert Theater and Shubert Alley. Angus McIndoe was the Eve Harrington to Joe Allen's Margo Channing. Angus was the maitre d﻿ at Joe Allen for years. Then there was the palace coup: Angus snared the prime location and, for a while, overshadowed the venerable Joe Allen. For those of you who like outside NYC, Joe Allen restaurant, on West 46th between 8th & 9th Avenues, has been the theater hang out for years. Every time I went there, I'd see at least one Broadway star - and maybe even a movie star. Joe Allen is famous for having Broadway posters adorning the walls. But the posters are of collossal flops. From Moose Murders to Carrie they were all on the wall of shame. It's a guilty pleasure to look at them and laugh. Another great thing about having dinner at Angus - you could use the bathroom during the intermission of the show you're seeing. Even the line for the men's room can be huge at Broadway shows. With Angus you could breeze in and use the bathroom and maybe even catch a quick drink. Very civilized. I had one memorable evening at Angus. 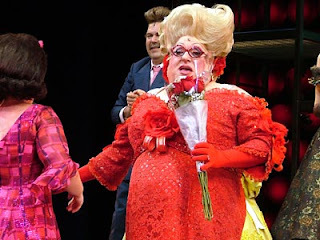 I went to see Bruce Vilanch in Hairspray. He invited me because I managed his house seats during his run. We had dinner on the top floor, which overlooks the Majestic Theater. 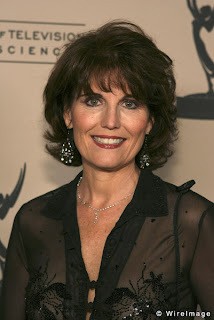 Lucy Arnaz was there and stopped by to say hello. As did Michael Bolton. I had lunch there with Donna Murphy and Sondra Lee in its heyday. It was the first time I met Donna in person - she wanted to thank me for managing her house seats in Wonderful Town. I was trying to act nonchalant but I was a nervous wreck and starting svitzing like crazy. It was summer - I was so embarrassed. But Donna was lovely about it. She and I are both friends of Sondra - she was the original Tiger Lilly in Peter Pan and Minnie Faye in Hello Dolly. Sondra is an original member of the Actor's Studio and teaches today - I studied from her when I was pursuing acting. But lately, the food at Angus has really gone downhill. 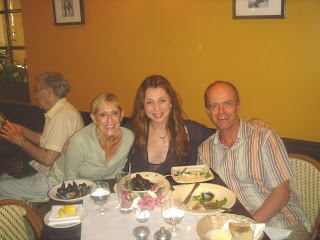 I met a friend Richard there last week before seeing Hugh Jackman: Back on Broadway. Richard arrived first and was digging into his fried calamari. I tasted it - it reminded me of Mrs. Paul's frozen calamari - it was like lard and tasted very fishy. I had a half dozen oysters - they looked anemic and had absolutely no flavor. The place was packed as usual, but it's only going to attract unsuspecting tourists if the shoddy quality continues. This wasn't the first bad experience I've had a Angus recently. Hopefully they will turn things around. After all - I need a place to use the bathroom at intermission! As I've posted, Vincenzino taught me some wonderful dishes when I studied with him on the Amalfi Coast. This is a favorite - zucchini with heirloom tomatoes and onions. ﻿ In the picture with me in the chef's hat on your right, I'm in Vincenzino's kitchen chopping zucchini. A lot of people comment on my huge NYC kitchen when It's actual Vincenzino's. My kitchen is your typical NYC shoebox. I had some bottled pearl onions that I added at the last minute - they're already cooked so they heat up and dissolve quickly. 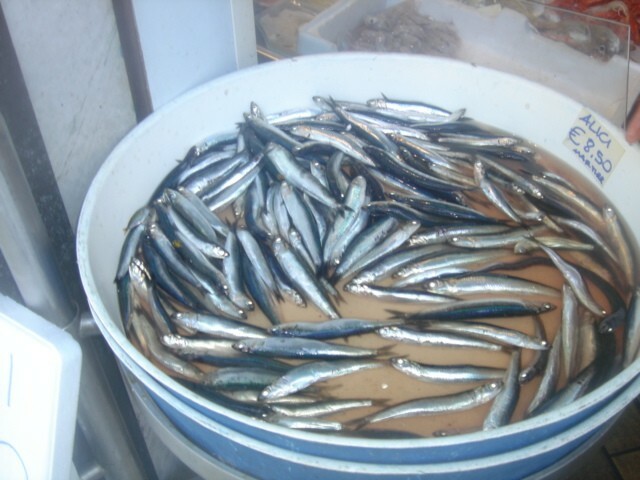 Per Vincenzino - add some coarse sea salt and fresh ground pepper and nothing else. The flavors are strong enough to stand on their own.﻿ Note my recipe calls for two tablespoons of olive oil and there's obviously a good deal of liquid in the photo above. This is because I added water to speed along the process. The water mixes with the ingredients and makes a nice gravy. Pre-heat sauté pan over medium heat. Chop zucchini into cubes. I cut them in half lenght-wise then cut the 2 halves in half and chop into cubes. Steaming is optional but if you steam cook them for 5 - 8 minutes. If you steam the zucchini, sauté the cherry tomatoes while they steam. If not, saute the zucchini first for a good five minutes before adding tomatoes. Once zucchini have steamed drain and add to the pan with the tomatoes. If desired and if zucchini are taking a bit long two cook add approximately 1/2 cup of hot water. The water will mix with the ingredients and make a nice gravy. If you have the bottled onions, add them a minute or two before the rest of the dish is finished cooking. Add salt and pepper. ﻿As zucchini's can vary in size you will have to do a taste test to see when they're done. Take a few cubes and let cool for a minute on a side plate and taste (you don't want to burn your mouth). 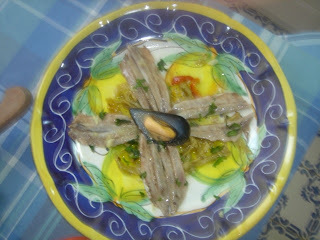 I served the zucchini with, of all things, tuna cerviche. I will post that recipe tomorrow. There's the char we're after! Here are my rules of thumb for cooking salmon filets: 1/2 pound serving per person and grill for two minutes on each side. As always, make sure the pan is really hot. Pre-heat over medium heat for several minutes before cooking. Put the flesh side down first - if you put the skin side down first you'll burn it off, and one of the great things about this dish is the crispy skin. At this time of year I'm really slammed at work and I come home very tired - usually at 7:30 or 8:00 PM or even later. I want a home cooked meal but I want it to be easy. Last night I cooked the salmon and heated up brocolli rabe that I bought prepared. So, we're talking about 8 minutes of cooking/preparing start to finish. I can handle that no matter how tired I am. 1/2 lb salmon filet per person. Wild salmon is the best. Pour 2 tbspns olive oil on the filet. The other 2 tpsns are for the skillet. My skillet is so well seasoned I don't even need to add oil. Add the dry ingredients, rub into filet and let stand and marinate. Pre-heat cast iron skillet over medium flame for 5 - 10 minutes. My skillet has the raised lines so you get grill marks as you would on a charcoal grill. Grill for 2 minutes on each side - put the flesh side down first. Even though I can be a fanatic about eating properly, I think it's important to throw caution to the wind every now and then and chow down on something that is decidely not﻿ skinny. That's what I did this weekend. Amazingly, the world didn't come to an end. Whether you're cooking fat or skinny, presentation is almost as important as taste. And\ easy way to amp up the visuals﻿ (and taste) is to use heirloom cherry tomatoes. The flecks of color really brighten up a dish, and they're as tasty as they look. Always cut them in half. I sprinkled with coarse sea salt above. I tried two different methods of cooking this sandwich. The first go round I cooked everything in my cast iron skillet - the sausage, tomatoes and sauerkraut. I added the roll at the end of the process. ﻿ The roll got a little extra charred and absorbed some of the liquid from the sauerkraut. It was actually delicious - I added a little Dijon mustard to the sausage and piled everything else on top. The second time around I grilled the roll first and put it in a warm oven. I cooked the sausage and added the tomatoes, but I microwaved the saurkraut in a separate dish. This was very good, too. If you want the roll dry and crispy go with the second method. Method two will probably appeal to more of you. With the first method and you grill everything together, the roll gets a bit soggy - but I like it because it was soggy with the saurkraut liquid. Decide for youself. Life is full of such tough decisions! When the sausage has the grill marks on the second side remove from heat and finish off in the microwave for 45 seconds. You don't want the inside to be raw. Note: I purchased sausage at Citarella and at Eataly. The sausage from Eataly was far superior. Yesterday was volunteer day at the company I work for. ﻿ One day each year, all employees help out at a variety of worthy charities that run the spectrum from sewing quilts for children in cancer wards to helping out at animal shelters. We call it "Walk the Walk" day. I signed up for New York Cares. My group visited a senior center in the Projects way up in northern Manhattan. Even though I live roughly 100 - 150 blocks away, it's a completely different world up there. When I got off the subway I passed a store that sells live poultry! It was very disturbing because the poor birds were stuffed in overcrowded cages. Hens, chickens, doves, pigeons, you name it, they were selling it. Volunteer days are as much for the volunteers as they are for the people (or animals) we're hoping to help. First, you get to know the people you work with a little bit better. Arthur and Neil work on different floors than I do and I don't get to see them very often. Bingo is a big deal at the center. Arthur called the numbers. He had to shout because some of the residents are hard of hearing. I left there counting my blessings. I live in my own apartment on the upper west side. I have a life outside of my apartment building. I get to go out to dinner, see Broadway shows﻿, take spin class, go swimming and I do get that occasional trip to Europe. Sometimes it just takes a look outside your world to realize there are people who are less fortunate than you are. The people I met yesterday certainly are less fortunate, but I didn't see anyone feeling sorry for themselves. They are grateful for what they have. When you won bingo you got a t-shirt and a scratch lottery ticket. Every person who won was thrilled.